As he studies the past, Jesus Pimentel keeps his focus squarely on the future. A history major with a minor in Latin American studies, he has set his sights on becoming a high school teacher and helping students who speak English as a second language attain the skills they need to succeed in college and life beyond the classroom. Pimentel has a keen understanding of the challenges ESL students frequently face. He, too, has faced challenges as an ESL student, a Dreamer and the first person in his family to attend college. The keys to success, he has learned, are perseverance and a willingness to reach out for advice when needed. Once he is a teacher, he hopes to hand those keys to his students and show them their options beyond high school. 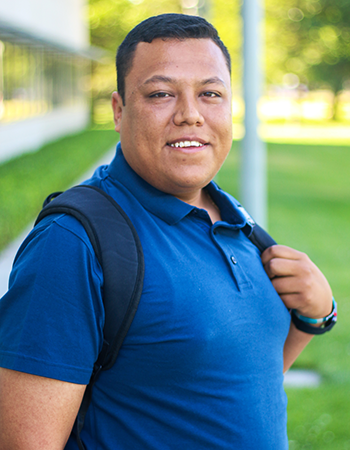 A transfer student from San Joaquin Delta College in Stockton, Pimentel started his Stanislaus State education at the Stockton Center and eventually took his final classes in Turlock. Over time, his professors say he has impressed them with polished assignments and sophisticated historical interpretations.